In the last 30 years, we have been asked many questions about wedding band engraving. I hope I can answer your questions with this infomation. 1. Can Titanium Rings be engraved? Yes, we can engrave them. Most jewelers say "No" because of the hardness of the metal and it wears out the diamonds used with engraving faster. 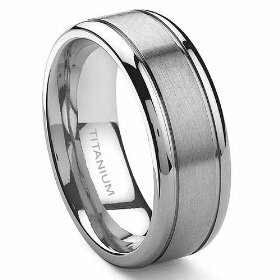 It is true the engraving on titanium rings is lighter, because of the hardness, but is very readable. 2. What should I have engrave inside the ring? The basic is both of your initials or first names and the wedding date. But you can do a lot more. Special sayings that have meaning to you or Special symbols - all can be engraved. Most Jewelers only have one size font to engrave in rings and have a limited number of letters that can be engraved. We have the ability to adjust the size of the letters so more can be engraved. Click Wording for Wedding Bands. 3. Can wedding bands be engraved on the outside? Yes, but wedding bands are usually engraved on the inside. Friendship rings are engraved on the outside. 4. What fonts are available for engraving? Jewelers usually give you two choices for engraving - Block or Script and you are not shown the fonts. At the Engraving Connection, we have multiple scripts and block fonts to choose from. You get exactly what you want. And guess what? We show you the actual font. 6. How long does it take to engrave your rings? Our normal service is to drop off your rings and pick up the next business day. You can call before coming in and see if we can fit you in on the same day. Mornings are a good time to call. Remember, depending how busy we are, we may or may not be able to fit you in that day. Many couples drop them off and go to Starbucks or lunch and come back in about an hour. That sure beats the Jeweler. They send out the rings - plan on a week to two weeks to get your rings back. 7. How much does it cost to engrave your wedding bands? Each ring is $22.00 for the first 10 letters, then 45 cents a letter. Stock logos are $5.00. And Custom designs cost $25.00 to be engraved. 8. Can all wedding bands be engraved? A few rings can not be engraved. the wedding bands need to be circular. Odd shaped rings on the outside do not fit into our holders. Some rings have diamonds all around the outside. Some of these rings, the diamonds go through to the inside of the ring leaving no room for engraving. The last possibility is rings that have stamping all around the inside of the ring leaving no room or very limited room for engraving. If two rings are soddered together we can not engrave them. Make sure to have your ring engraved be for soddering. 9. When should you have your rings engraved? After your rings are sized. If you have your wedding bands engraved before sizing, you run the risk of distorted letters. The Jeweler is actually stretching or squeezing the rings while sizing. It is more than once we have had couples coming back to have the the rings buffed out and re-engraved. This all cost more money. We want to avoid that. I hope I answered all your questions. If not, call us at 877-8-AWARDS or email us at etched@engravecon.com . We would love to answer your questions. At the Engraving Connection, we want your wedding band engraving business. I have shown all the advantages to make the trip to Plymouth to have your rings engraved. Each band is $22.00 for the first 10 letters, then 45 cents a letter. Shipping is $7.00 UPS Ground.